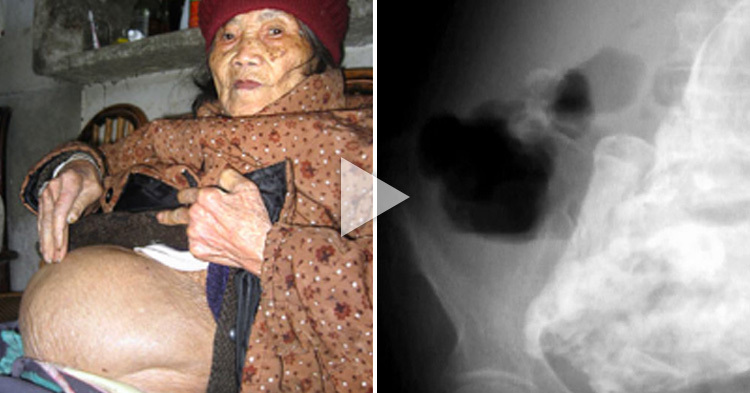 This is a bizarre news, but what really happened to this 92-year-old woman was unbelievable! A senior woman from Chile found out that she was pregnant for the past 50 years or so. She never realized that she was carrying a "stone baby". Until she underwent an x-ray in a hospital after suffering injuries after she fell. 92-year-old woman was pregnant for almost 50 years with a "stone fetus"
The doctors discovered a 50-year-old stone fetus inside her abdomen. The x-ray taken at the Chilean hospital in San Antonio showed a 4.4 pound stone fetus inside her abdomen and outside her womb. According to the doctors who studied her x-ray, the large fetus that occupied all of her abdominal cavity was seven months old at the time of death. The unborn child which had calcified in the woman's body is known as a "lithopedion" or stone fetus. This is where in the unborn child develops outside the womb and becomes calcified and occurs when a fetus dies during pregnancy and then becomes calcified outside the uterus. The woman said she had no any idea that she was carrying a stone fetus for almost 50 years or so. But the doctors said that it was an "extraordinarily rare" case. She has now been sent home and doctors say it is unlikely they will attempt to remove the unborn baby, given the risks an operation would carry for a patient of her age. This is a rare condition that there are only around 400 cases of it documented in history. Lithopedion is a Greek word for "stone baby". Another case was with an 82-year-old Columbian woman who was carrying a son fetus for 40 years. Doctors though that the stomach pain she was feeling was due to bugs, but as soon as the scans are revealed she was suffering a rare case "lithopedion". The woman's fetus developed in her abdomen, which is not a "viable place" for it to grow. She will now undergo a surgery to remove the lithopedion. In this case, the dead fetus has no way to leave the mother's body, instead of allowing it to rot inside the abdomen and expose the mother to some infections. Her body works to calcify it or mummify it in calcium.